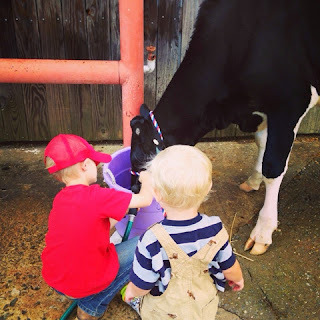 Welcome to day 17 of 31 days of Farming & Family. Now all the families we have shared over the course of the month thus far have been what most folks consider family. They share the same houses, day to day happenings etc. Today's family is a little different. This family doesn't share the same address, they may not even cheer for the same football teams (shocking but true), but they share a passion for livestock. It's typically generations deep and the show ring is the tie that binds. 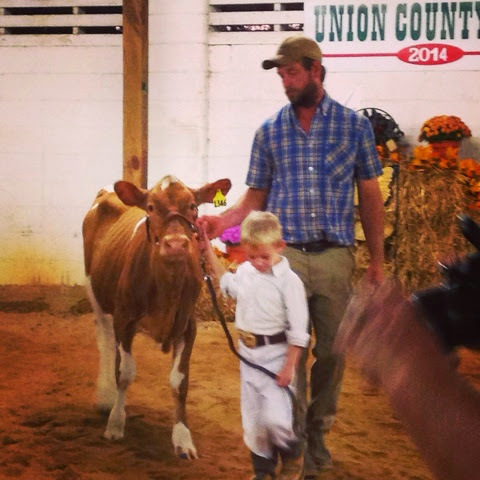 Last night the Farmboy showed in the last show of the season...a dairy show. He did a great job for only his second dairy show ever. He has greatly improved since September. He brought home a 1st, a 2nd and a 4th....honestly I was most proud of the 4th. He still likes the reassurance of someone in the ring with him...especially after the showmanship class last night...but we will get to that in a minute. Learning to work with and walk a heifer in a show ring is hard. 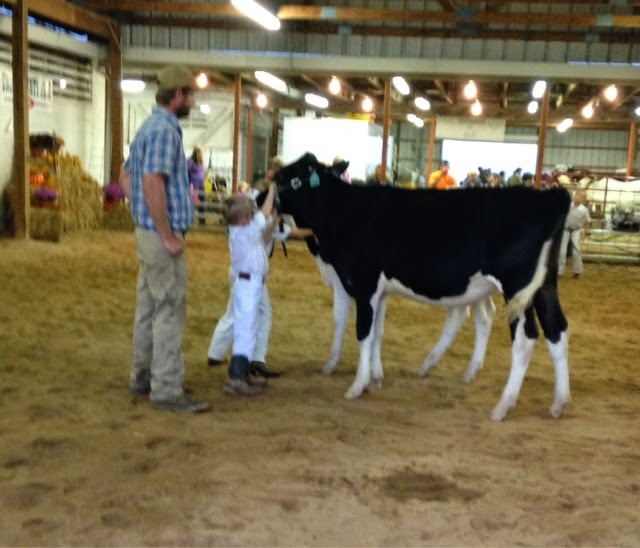 Not only do you have all the normal distractions a 6 year old and a young heifer bring but also a new location, fair goers and other calves & kids in the ring. This makes heifers and kids nervous. Now don't get me wrong these dairy heifers are gentle and easy going. Most have been handled daily since birth, but every once in a while they get a wild hair. And last night it happened. As the Farmboy's showmanship class was entering the ring the heifer in front of him was cutting circles. She was a ball of energy. The young man showing her was doing a great job of keeping his cool. About halfway around the ring he fell and ended up under the heifer. Farmboy's heifer got caught up in the wreck but he had hold of her and then I saw her run across the ring too...without Farmboy. In typical momma fashion, I kinda panicked...was he caught up too...as I quickly scanned the ring I saw the Farmboy squatted down to the ground with his arms around his fellow showman and best bud, Drew, searching the ring desperately for help from an adult. Of course more than half a dozen folks quickly came to the rescue catching loose calves, comforting kids and quickly returning order to the showring. Drew had a few scratches and bruises and had to sit out the rest of the class but was back on his feet in no time. 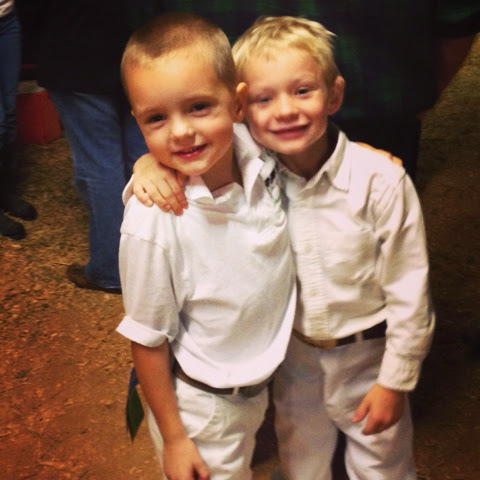 You see my farmboy had let his heifer go to check on and comfort his friend. He didn't worry about coming in first, because as he has told me a million times during our practice sessions...it's not all about winning. And while he is 100 percent correct, those of you who truly know me...know that I believe you give 150% in the show ring. 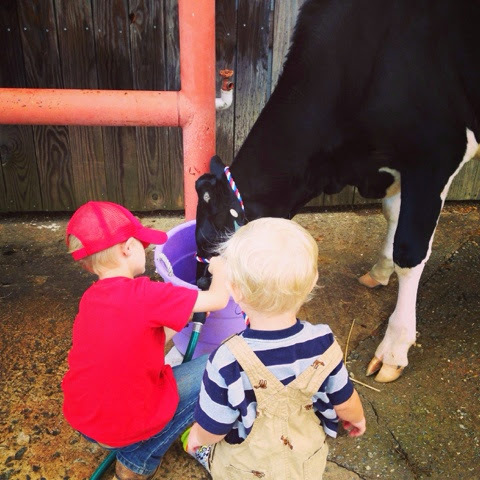 Farmboy's immediate focus was on ensuring his buddy was OK. He showed us all last night what stock showing really is all about. 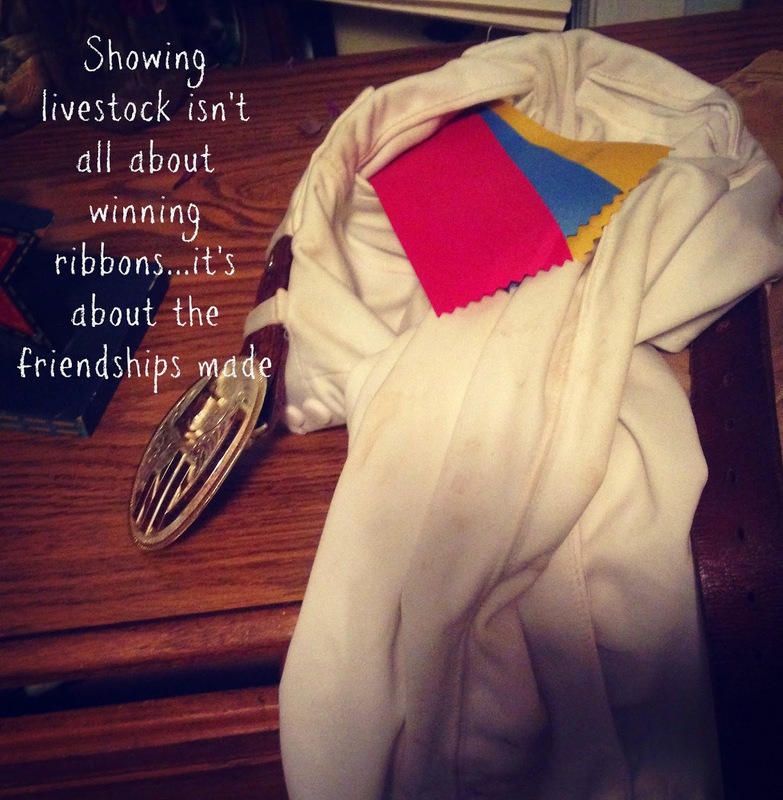 The blue ribbons are nice, banners are great but the true treasures are the friendships and lessons learned in and out of the ring. Since the Farmboy let his heifer go he placed 4th in showmanship and this stock show mom is perfectly happy with that! These aren't friendships that are over at the end of the season. These are friends whom you continue to grow and laugh with...who probably know more about you than your school friends do. They wait patiently on you to arrive at the next show, they make sure you are penned or tied somewhat close together or if not they know where you are before you do. You wash cows together, help each other feed, people watch at the fairs, and help you walk your calves to tie outs over a half mile away in the rain...so you can get done sooner. These friends become like a family to you. You can't imagine a show without them. I am still in contact with many of the friends I made showing livestock. You never know when you will be a 1,000 miles from home, looking through sale animals, only to find a friend or their parents on the other side of the ring. It truly is a family reunion at times like that. Here are the two buddies later in the evening. Both ended up with blue ribbons before the night was over, lots of smiles and a few new "battle wounds" to show off at school today. 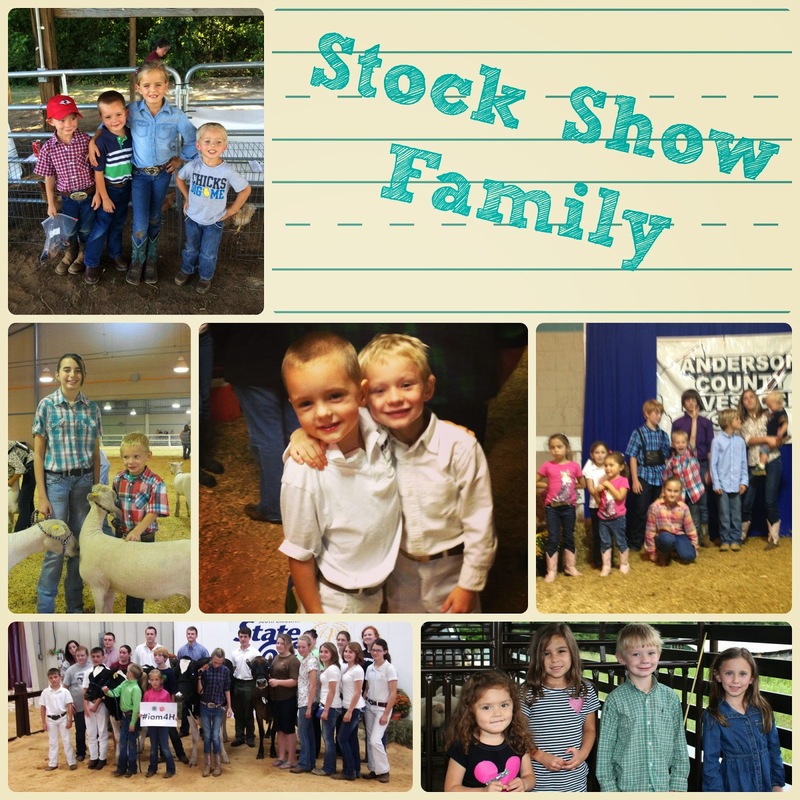 Are you part of a stock show family? What's your favorite "family" memory? ?